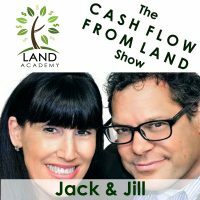 Steven Butala: Today Jill and I talk about the truth about land acquisitions all week. It’s everybody just wants the truth. We are gonna tell you the good, the bad, and the ugly about, and there’s not too much ugly, the truth in acquisitions. We’re gonna talk about the stuff that nobody ever talks about unless they got 3,000 deals under their belt. Jill DeWit: You know what’s funny? Of all the property types you could possibly, seriously, this is what’s interesting. If you’re worried about land, we really got to talk because of all the property types that you could be flipping on the planet, this is probably the easiest. Steven Butala: I couldn’t agree more. Steven Butala: Which is long term care buildings. Jill DeWit: If you can handle that, you can handle land. Steven Butala: Before we get to the topic, though, lets’ take a question posted by one of our members on the landinvestors.com online community. It’s free. Jill DeWit: Okay, wait. I have to say something really funny, though. Maybe if we have time at the end of the show, I’m writing a note here, I would like to play a game called if you can handle that, getting a PhD, you know what I mean? Jill DeWit: Because that’s what so funny, some people are like, well, I’m a biochemical research analyst, and I’m trying to wrap my head around this whole land thing. Jill DeWit: You know what I mean? Steven Butala: Yeah, I read all the time. Jill DeWit: [crosstalk 00:01:42] I’m like, are you kidding me? Steven Butala: I read that stuff all the time in land investors. Steven Butala: I’m like, what do you mean? Jill DeWit: This is you goofing off on a video game compared to what you do in real life. Steven Butala: Yeah, it’s probably two work days. Steven Butala: Of your whole year. Jill DeWit: Of your real job. Steven Butala: And then you know how to do it. Steven Butala: How to price this trailer. Jill DeWit: Talking to a seller. Steven Butala: Right. I see that all the time. I had that same thought. We’ve never talked about that. That’s funny. Jill DeWit: Oh, yeah. So, we’ll play that. I’ll try to get to the end and remind you of that. We’ll do, if you can handle that, you can handle this. That’ll be good. Jill DeWit: Oh my gosh, you can handle land. Steven Butala: Well, here, I’m gonna actually technically answer this. Steven Butala: Specifically lender wrap, like mortgage brokers, okay? Steven Butala: Not just the, the lenders themselves usually have please fill this out, fill this out, fill this out, and we’ll let you know in three days. Steven Butala: Mortgage brokers are, you have to go through all kinds of … you have to feed their ego. Don’t get me started. Now, and then regulations, inspections, maybe if there’s government regulation involved like I just mentioned, that’s what complicates deals. So, right at the beginning of this show, I said there’s a reason we sell land, and it’s all because I did all that stuff. Steven Butala: Before we started buying and selling land. I kept going over in my head, saying, this is ridiculous. Steven Butala: Why is this so complicated? We’re just buying property. Jill DeWit: Shouldn’t be this hard. Steven Butala: Why does it, three weeks, this is back then. Jill DeWit: He wants to sell, I want to buy. Steven Butala: Three weeks, three weeks to get a lender approval? On a $100,000 loan? Come on. Steven Butala: That’s on our side and understands the business and has some experience. That’s it. Steven Butala: A buyer, a seller, a checkbook, and a title agent. That’s [inaudible 00:04:13]. Steven Butala: One sentence, well, two sentence, one sentences questions like that. Steven Butala: What’s the difference between this and this? Jill DeWit: Yeah. Man, if you, and I love it. One of the things I love is a lot of people that come to us, they’ve tried, they’ve flipped houses and they’ve done this and they’ve done that and they’re like, I know that there’s something for me in real estate investment, but I’m so sick of that, and I’m like, oh, you’re gonna love this. It’s funny because we talk weeks and months later, they’re like, oh my gosh, you’re right. This is so much easier. Steven Butala: I’ve heard that. Jill DeWit: It’s not worth it. He’s with us now. It’s so darn funny. I’m like, yup. I understand. Steven Butala: A couple years ago Jill and I were in the grocery store together, and I’m gonna throw you under the bus here a little bit. Steven Butala: It’s not a bad thing. It’s a good thing. Steven Butala: Our differences are good. Jill DeWit: I think so. Jill DeWit: More than four ingredients. Steven Butala: Do you remember that? Jill DeWit: Not right now. Steven Butala: I stopped and I’m like, wait a second. How the hell, it’s not worth it. Steven Butala: Why would I sit down and make all this, it’s not gonna taste good, and you know what? She was absolutely right. That’s what we do now. Steven Butala: Four ingredient meals and stuff. Jill DeWit: Otherwise, we’re going out. Steven Butala: It’s just as good. Jill DeWit: I think that’s so good. Steven Butala: Do a real estate deal where you make 100 grand at the end and there’s 22 steps, or do you want there to be four steps? Jill DeWit: And you make 20 each time, and you do them in half the time. Steven Butala: You only seek out the easy ones then. Steven Butala: Now there’s less people involved, less ingredients, less reading, just less. Steven Butala: Most importantly, your risk when there’s less steps like this, is dramatically reduced. In some cases, I would argue eliminated. Steven Butala: Because there’s just no way you can lose. Steven Butala: What’s gonna happen to a piece of land? The asset itself, if it burns down? Steven Butala: In a lot of cases, it’s worth more. It’s worth more than when you started. Jill DeWit: Yeah, great, it just cleared all the brush. I love it. Steven Butala: But so those are the differences. Here’s the similarities. All real estate deals have this in common. Buy low, sell high. There’s no replacement for that. Steven Butala: We live in a day and age, this day and age where there’s an abundance of data, which all but eliminates risk for you. The more data the better. Steven Butala: Today’s topic, the truth about land acquisitions. This is the meat of the show. Jill, I know you did a ton of, or, wrote a bunch of notes before this. Steven Butala: Sometimes she writes none, and she just shows up and sits down and looks good. Steven Butala: But you got a ton of stuff here. Steven Butala: So, go ahead. Jill DeWit: So, I have a lot I want to cover here. I want to talk about first, we’re gonna cover what’s really involved. I want to talk about some of the negatives, because this is the truth about land acquisitions. Then I want to talk about, wrap it up with how to really kill it, because over the years, we’ve been doing this for how many years? Three or, over three years. Steven Butala: It’s just over, well, land academy’s over three. Jill DeWit: Well, yeah, but not the whole business, since the ’90s. Steven Butala: We’ve been buying and selling real estate for 25 years. Jill DeWit: Yeah, so that’s going on 30 years for you, by the way. Not to throw you under the bus. Steven Butala: I live under the bus. Jill DeWit: I know. You like it there, it’s shady. So, all right, that’s a good one. Steven Butala: You like me there. That’s what I think. Where’s dad? Oh, he’s under the bus. Jill DeWit: Fixing something. No. All right, so let’s talk about what’s really involved in land acquisitions. I want to talk about, too who are good candidates and who are not good candidates, because that’ll help us with what’s involved, like data. Take it, please. Steven Butala: What’s the question? I was thinking about living under a bus. Jill DeWit: Oh, you’re just distracted. Steven Butala: I was thinking, every man thinks about this stuff. Listen to this. Jill DeWit: Okay. Distract Jill. Jill DeWit: Like an RV bus, not just a bus? Steven Butala: Or maybe, or in a forest or something like that, because it’s simpler. Men want to simplify stuff, and living under a bus for a couple days doesn’t sound that bad to me. Jill DeWit: How about living in a bus? Jill DeWit: Okay, thank you. Steven Butala: In the bus is good? Jill DeWit: In the bus is good. I don’t know why you need to be under it, but okay. Okay, so here’s the thing. What’s really involved? What do you need to know to make it? What can you not be afraid of, like Excel? Steven Butala: So, the truth about land acquisitions, not sales, not emotion, any of that stuff, is that they’re really, really easy. We alluded to it earlier on. It takes a willing seller, and it’s your job to find that. You are the willing buyer. A little bit of money, and somebody who’s gonna close a deal. A lot of times you just close the deal if it’s small enough. Steven Butala: So, land acquisitions are all about finding that seller, and the most efficient way to find sellers for a lot of years, I would travel around the country going to tax deed auctions, and that’s how I found the seller. This is kind of when the internet was just starting to really kick it. It was during that time when you, to get an internet connection, you put it through a phone line. Steven Butala: DSL. Not cable like we have now. There was no such thing as WiFi, so there were much fewer people on that. Steven Butala: It was efficient. Now the auctions are overrun, and that’s fine. Steven Butala: That’s how we discovered sending mail out. Steven Butala: The truth about land acquisitions, the real truth, the stuff that nobody talks about, they’re very, very easy to buy. There’s a lot of unwanted land out there from people that live out of state or whatever, and they’ll just almost give it away. Steven Butala: It’s a little bit more complicated to sell it. Here’s a reason. Steven Butala: The people who sell property, the price is the reason property sells period. So, the only reason that land doesn’t sell almost immediately when you buy it is number one you paid too much. Well, none of us do that anymore. Steven Butala: Number two, the people that are most interested in buying the property don’t know it’s for sale. Steven Butala: You’re not reaching the right people. That, and I’ll be it, the truth about land acquisitions. Tomorrow, by the way, is the truth about land sales. Steven Butala: The land sales for that tomorrow, but you have to go through, here’s some broad numbers. If you send out 300 to 500 direct mail offers, done properly, you’re gonna buy a piece of real estate. I mean, for great prices. That’s the truth. Steven Butala: Clean their clothes get. Jill DeWit: You know what’s so funny? Steven Butala: People just need to know about it. Jill DeWit: Oh, well, it’s good, like I said, it’s every business. Do you think American Express walks around with every single person calling them, saying I love you? No. Steven Butala: Why American Express? Jill DeWit: Well, I’m just, dream it up. Dream up any company, I don’t care who it is, there’s unhappy customers, and there’s people doing charge backs and whatever there is. They’re always gonna have something like that. So, I don’t think it’s that big of a deal. But I do think that some people can’t handle it, and that’s the same people that couldn’t handle, and that’s why they might be a librarian. Jill DeWit: Or anybody. Anybody that raises their voice. Thank God for you. Steven Butala: You should live in our house for a while. Jill DeWit: Can you imagine if we met and I said I’m a librarian? After you get past the outfit, you realize it’s really not what you want. I mean you, not everybody. For some people, that’s perfect. We know a couple, and we know a librarian, and they do really great, and we love them, so anyway, and she’s awesome. What’s funny is she’s not your normal librarian, but she is in the library. Steven Butala: Here’s some things that you can expect when you start to buy land. Number one, you have to review each property for its specific level of access, especially rural vacant land. Can you get to it physically, and does it have legal access? So, you need to really look into that. Should it stop you from this career? No. But you get a lot of properties in where you get excited and there’s just, oh, there’s no access. I’m gonna choose not to buy this property. It doesn’t have any access. Steven Butala: That said, there are members in our group, we’re not one of them, who specialize in no access land because they get it for nothing, and then they spend the money to make it either have access or they have a group of buyers that it just doesn’t bother them. Steven Butala: Access is an issue. Jill DeWit: This is good. Steven Butala: Here’s anther, the real truth. There’s a lot of dead people who own real estate, who own land, and it’s not that they planned on dying, they just did. They didn’t have their stuff, their affairs all in order before that happened. So, we talked to, Jill and I and all of our members daily talk to children or heirs, let’s call them, of estates where they’re not experts in that by any stretch, and they are looking to us to help them solve this problem. It’s, oh, the property’s not in my name, in my … we just bought a house. Today we closed on it. The mother’s been dead for 10 years, and it was all a mess, and Jill undid it, and we bought a property for a very attractive amount of money, and solved a bunch of back tax problems and all kinds of stuff. In fact, that’s what we’re both gonna do when we get out of here. So, these are the things, this is the real truth about buying land. If these things, like Jill said, if we have to whisper and tiptoe around it’s just out of your comfort level, this is not for you. Jill DeWit: Well, here’s the thing. There are a lot of moving parts, but none of it’s crazy. The big picture thing about acquisitions is it all starts there. I know we’re gonna talk more about it tomorrow, and I love the saying that you have, which is good acquisition solves all sales problems, which is really, really true. Steven Butala: The day we buy it. Jill DeWit: Checks out and they pay and we see the payment go through, and like, oh, we sold that. That’s not our high five moment. Steven Butala: We know that’s gonna happen. Steven Butala: Out to dinner and stuff. Jill DeWit: Now quickly, we got to get the deed out to her and get the notary now before anybody changes their minds. Not that they would, but you know what I mean? It’s all, you solved a problem, you’re solving problems, that’s another good thing about this. You’re meeting, you’re talking to people that often bought land for some purpose. This is an interesting thing I want to bring up. Usually you buy vacant land not always as an investment. It seems like the people we talk to, a lot of them, they were gonna do something with it. Steven Butala: Put a bus on it and live under there. Jill DeWit: They were gonna retire there, they were gonna build a cabin there, they were gonna do something with it, so sometimes it’s a little bit kind of sad for them to part for these things, and often they’re reaching back out to us because they have a need to get rid of it. Maybe they are retiring and they don’t want this on their balance sheet anymore, the kids don’t want it, whatever. So, you’re solving problems. There are a lot of moving parts. Sure, just like everything you’re gonna have people, like Steven said, that are gonna be not thrilled with your offer. Big deal. We always kind of giggle and say, okay, thank you. Steven Butala: Here’s the good news. Steven Butala: So, those are the real truth points. If I can think of anything else, we’ll talk about it here in the after show, but here’s the good news. You can make an absolute fortune doing this. Steven Butala: Jill and I have made tens of millions of dollars saying lands, but let’s talk about the truth, though. Everybody says tens of millions of dollars in real estate and oh, that’s a nice new yacht you have, and all that. All you need to do is concentrate on that first deal if you haven’t done one, and then the second one. Then get to 10 deals, and decide if it’s for you. Then decide on what your minimum dollar threshold per transaction is. Jill and I are working on a deal right now, we’re gonna buy the property for about $200,000. We’re gonna split it all up. It’s actually pre-zoned to be 14 pieces of property in a very urban area, and at the end of the whole thing, we’re gonna participate with the developer to build on it. We’ll net about $2 million. Now, that’s what you have to look forward to if you stick with it and do the $40,000 deals. But can this easily replace your job the second year, let’s say, after you’ve got … easily. Easily. Follow me on this. You buy property for four grand and you sell it for eight. Now you have eight thousand bucks in the bank. Then you do it again, 16 times two, 32 times two, you’re gonna have a couple hundred thousand dollars in the bank very quickly as long as you don’t make bad acquisition decisions and you learn how to send out mailers properly. That’s the truth about buying land. Jill DeWit: I have a good one. I have a good one. I have a good one. Steven Butala: I’ve seen people fail, dismally fail, at this for this one reason. They got sidetracked, and usually it’s because you send a mailer out and a guy says, “Absolutely, I’ll sell you this property. Thanks. Let’s do that. But oh, hey, by the way, I have this property over here. Why don’t you make me an offer on it?” They make an offer, it’s out of, all the data, you just threw all that out of the window. Everything you learned, you never made an offer in Excel first. Jill DeWit: I’ll be over here. Jill DeWit: Are you done now? Steven Butala: That’s just, that’s what you gotta be careful of. Yeah, go ahead. Jill DeWit: Okay. All right. Steven Butala: Wow. Are you done now? Jill DeWit: That was long. That was long. I’m teasing you. Jill DeWit: You’re all good. Steven Butala: I’m excited about it. You’re not teasing me, you’re honest. Jill DeWit: I love you love this. What’s this? No, you’re good. No, I’m teasing. Jill DeWit: Not you, yeah. Steven Butala: I don’t think so. Jill DeWit: I am teasing. You’re all good. Steven Butala: This is truth week. Jill DeWit: I know it is. Steven Butala: You can tell the truth. Jill DeWit: Well, all right, that was a little long. Tell you the truth. Okay. Can we each do one last one, please? Jill DeWit: Okay. Thank you. I have one last one. One of my number one truths I love about land acquisition is people don’t get it. Steven Butala: Yeah. That’s true. Jill DeWit: I love, it makes me so happy when I talk to people and they, well, maybe they … I don’t know. For whatever reason, they figure out we’re doing well in life, let’s just say that, and so there’s some, a common question is what the heck do you guys do, right? Jill DeWit: Because they’re all in. Maybe I share. I might, depending on the person, I might say, well, as a matter of fact, we flip a lot of properties. Oh, like houses, or what do you do? I’m like, no, a lot of it’s just mostly rural, vacant land. They gloss over, and they think it’s dumb, or whatever it is, they don’t get it. They’re like, oh, there’s no value there. Kind of thing, and I’m like, yay. Steven Butala: Yeah, there’s no value. Jill DeWit: That’s awesome. Because you know what that is to me? One less person that I’m competing with. Not that it matters with anyway, there’s not really any competition, and that’s the truth. There’s not a lot of us. Steven Butala: In the last 20 years. Steven Butala: Not even a single instance. Jill DeWit: I get excited when people don’t get this. I’m like, awesome. Because it’s not hard. If you, even if you do get it, you win. Thank you. Steven Butala: Well, you’ve done it again. You spent another 20 minutes listening to the land academy show. Join us next time where we discuss the truth about land sales. Jill DeWit: And we answer your questions, should you have one, post it on our free online community found off of landinvestors.com. Jill DeWit: Okay. We didn’t get to do our thing, which I thought was actually even better, our end, if you can handle that game. So, I thought, let’s do it tomorrow on Friday. Steven Butala: That sounds good. Jill DeWit: So that’ll be good. Because like we said, we alluded today, the acquisitions solve a lot of sales things. So, we’re not gonna have as much to talk about on sales. But we will have some good stuff. Steven Butala: Sales is, yeah, all you. Steven Butala: How do you sell a piece of land, Jill? Save it for tomorrow. Jill DeWit: Share the fun by subscribing on iTunes or wherever you are listening, or maybe you’re watching us on YouTube, and please subscribe there, too.